Making chocolate to protect one of the most endangered primates species in the world, the Ecuadorian brown-headed spider monkey and its habitat, the Ecuadorian Chocó. Washu Chocolate works with a small community of cacao producers from Tesoro Escondido in Ecuador. Not only do they harvest a variety of fine-flavoured cacao called "Nacional" but they also take part in one of the largest forest conservation efforts in the province of Esmeraldas. Our chocolate supports fair trade practices, community-led development, environmental awareness programmes, scientific research and the rehabilitation of spider monkey victims of ilegal wildlife trade. Thanks to this chocolate, we contribute to rescuing the Ecuadorian brown-headed spider monkey and its habitat from the brink of extinction. 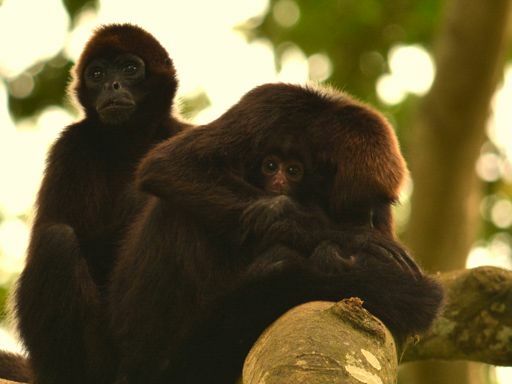 Washus or spider monkeys live in the last remaining forests of the Ecuadorian coast. They feed off fruit, dispersing their seeds across hectares and hectares of primary forest, thus contributing to the ecological balance of the Ecuadorian Chocó. Females breastfeed their offsprings for three years and protect them with their lives. Sadly, they are on the verge of extinction because of severe deforestation, illegal hunting and illegal wildlife trade. This primate species is the most endangered in Ecuador and is listed amongst the top 25 most endangered globally. Washu Chocolate's mission is to create a space for socially and environmentally-minded consumers of high-quality chocolate in order to address the critical situation facing biodiversity hotspots in Ecuador and across the world. We, alongside the farming community of Tesoro Escondido, invite you to take part in our conservation efforts through the responsible consumption of our chocolate. 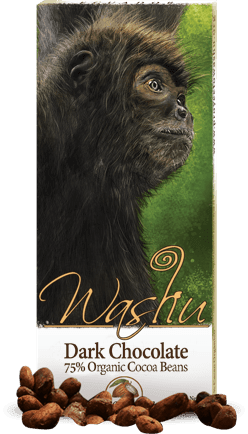 Washu Chocolate aims to become a protection fund for critically endangered species such as the Ecuadorian brown-headed spider monkey. A percentage of the profits generated through the sales of our chocolate will be reinvested in conservation and community-led development strategies to support the efforts of our sister NGO, Proyecto Washu, and the ASOPROTESCO cooperative in Tesoro Escondido. 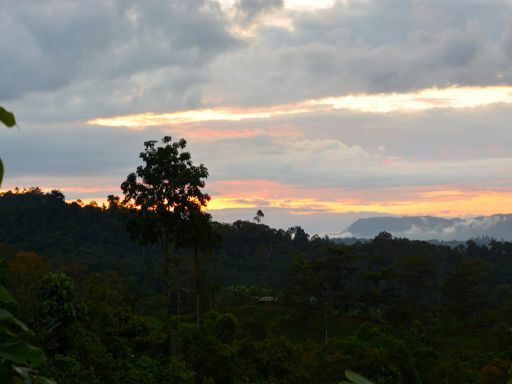 The Chocó is one of the most biodiverse places on Earth.  In Ecuador, 95% of its original forest cover has already been lost due to logging, mining and the expansion of monocultures and unsustainable agricultural practices. We believe in active, participatory and community-led conservation thus making the producers of Tesoro Escondido the principal protectors of the primary forests. Over the last years, they have perfected their knowledge on organic farming, post-harvest techniques and agroforestry thanks to the tireless support of cacao experts. This has allowed the community to access new and more responsible markets and promote their conservation success story around the world. Washu Chocolate would not exist without them! At present, more than 250 hectares of primary forest are being protected thanks to the dedication and commitment of the cacao producers. They are home to an extremely diverse number of critically endangered animal and plant species amongst which we find spider monkeys (Washu*), jaguars (Pillangela*), the green macaw (Akra*) and the long-wattled umbrellabird. *Words in Cha'palaa, the language of the Chachi people which call these forests home. Washu Chocolate is made with a fine-flavoured cacao variety called 'Nacional'. It is carefully harvested, fermented and dried by the producers of the ASOPROTESCO association on their own farms in Tesoro Escondido before being shipped to the Ecuadorian capital for transformation into our chocolate bars. This strong yet delicate chocolate is certified organic. This sweet and delicious chocolate is made with 100% organic cacao beans. The great thing about our team is that we are made of individuals from very different professional and geographical backgrounds. What unites us is our firm conviction in social and environmental justice hence our determination to position Washu Chocolate as an inspirational advocator of fair trade, conservation and environmentally-friendly practices in Ecuador and around the world. 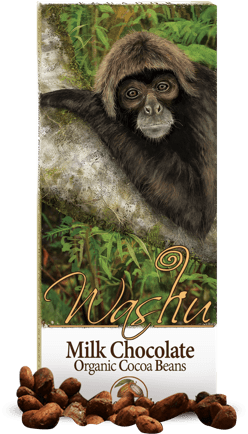 Thanks to the talented work of conservation-minded local illustrators, Washu Chocolate brings you a concept which connects chocolate lovers worldwide with the species we protect in the Ecuadorian Chocó. We are proud to showcase on our packaging the work of Latin American artists who believe that representing the richness and diversity of their land will allow for greater conservation efforts. We remain a very small enterprise. However, we are working as quickly as we can to provide you with a service that will allow to purchase our chocolate online. In the meantime, please don't hesitate to contact us using the information below and we'll try to send us our bars as quickly as possible. Many thanks!